Each year, Woodlore carry out a rigorous recruitment week in the woods, putting applicants to the test in order to find the very best staff around. Succesful applicants of this stage are then trained up and brought on to help run our Bushcraft courses. For our UK-based Bushcraft Courses, we are proud to welcome Darren Bates, Ben Gray and Nick Thompson to the fold. All three have a clear passion for the outdoors and have proved themselves to be great additions to our team. On the Wilderness Expeditions front, we are excited to welcome Tony Pape to our team of Specialist Instructors. Tony – better known as Blue – will be leading this year’s Canoeing in the Ardeche course, a week-long expedition through the picturesque Ardeche Gorge in Southern France. If you’re planning to attend one of our courses, please check out these new instructor profiles, where you can get to know the team before you arrive. 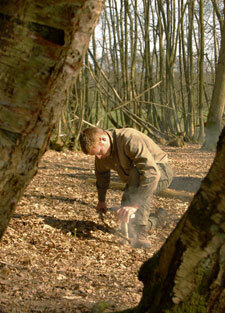 This entry was posted in Bushcraft Courses & Expeditions on April 21, 2010 by Woodlore Team. Hello. Have you ever thought about running corporate team building away days? Where ‘pot bound’ office workers are pulled away from their desks and energised with a renewed understanding of the importance of team working? Personally, I’d love to see something like this. I think it would go down a treat.